Heat oven to 375°F. Spray large cookie sheets with cooking spray. Open can of dough; do not unroll. With serrated knife, cut dough into 16 slices. Flatten to 2-inch circles. 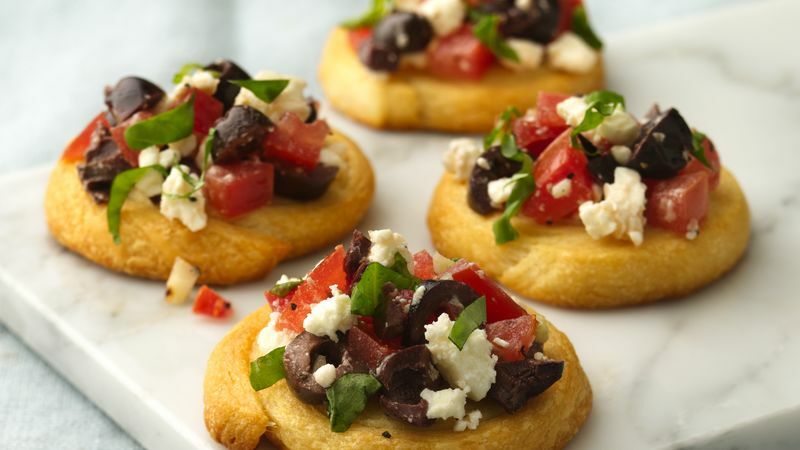 In small bowl, mix 1 tablespoon olive oil and the garlic; brush on tops of dough circles. Place on cookie sheet. Bake 10 to 15 minutes or until deep golden brown. Meanwhile, in small bowl, mix remaining ingredients. Spoon slightly less than 1 tablespoon tomato mixture on each crostini. Serve immediately. Plum tomatoes, sometimes called Italian plum or Roma tomatoes, are flavorful, egg-shaped and either red or yellow.